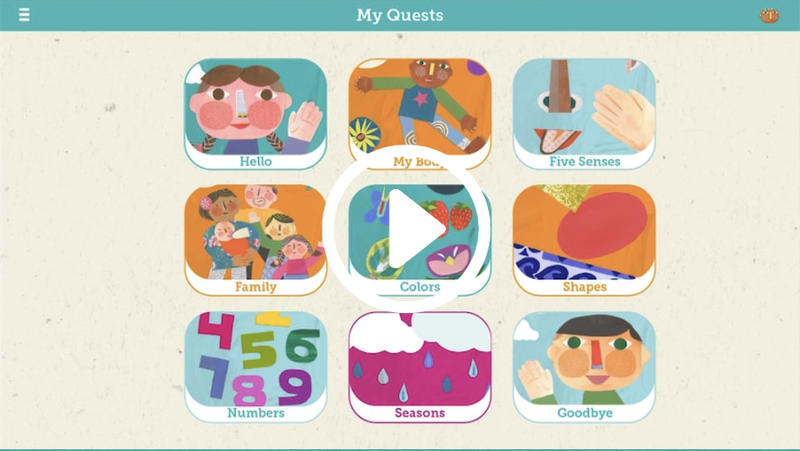 Zid Zid is not just another app for a child. We believe language is a spirit that can be harnessed, and during early childhood is the perfect time, and we believe, done together, is best. More than a language learning platform, Zid Zid a mindset and an opportunity, for you and the preschool children in your class. 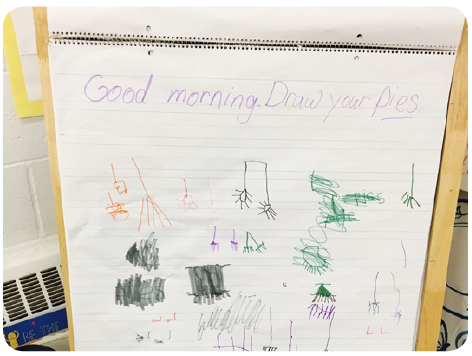 It’s an opportunity to open doors, and to connect with each child, connect with parents, with the Zid Zid online community, and with the global community at large, all while strengthening kindergarten readiness. There is no right or wrong way to implement Zid Zid. It’s designed to be put into action, the learning as you see fit, incorporating concepts that dovetail with concepts you currently teach. Zid Zid is accessible at any point and is easy to use. have you on this journey with us. 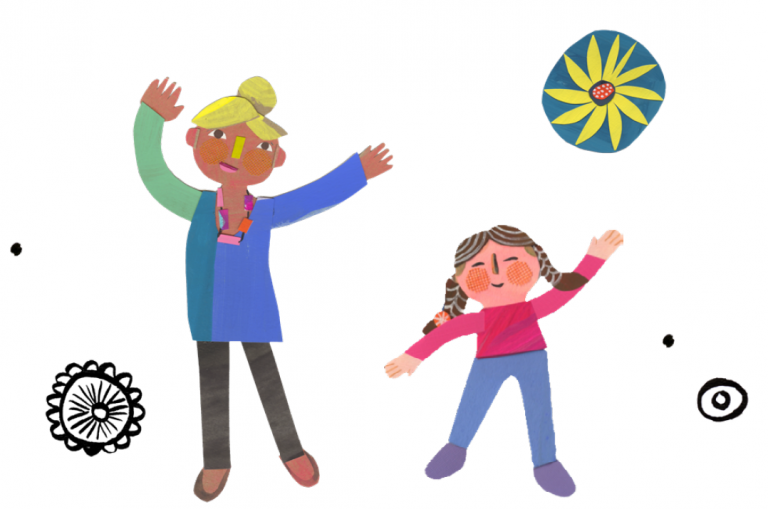 We firmly believe in learning a language through play, done together. Here are nine powerful reasons and benefits as to why. Being a preschool teacher gives you unlimited freedom to explore parts of yourself that thrive from childlike experiences. With languages, it’s no different. Refresh your imagination and creative skills by exploring learning a new language together, implementing exciting activities, and reaching learning outcomes together. 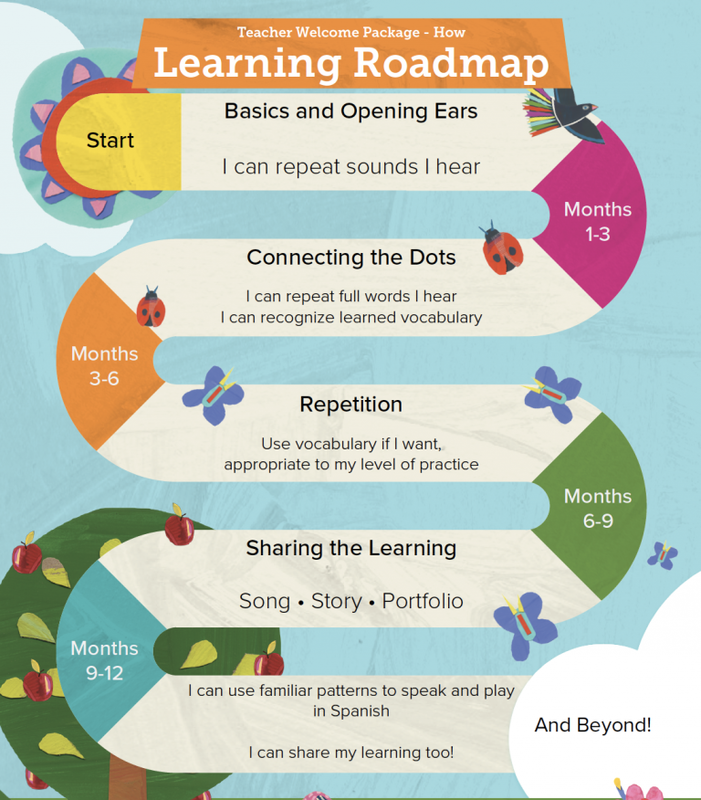 We believe songs and stories are one of the best pathways for learning. We also believe songs and stories are something the children can learn easily and quickly and can be transformative in any classroom. Our goals are built around empowering you and your class to learn new songs and stories easily and play along the way. 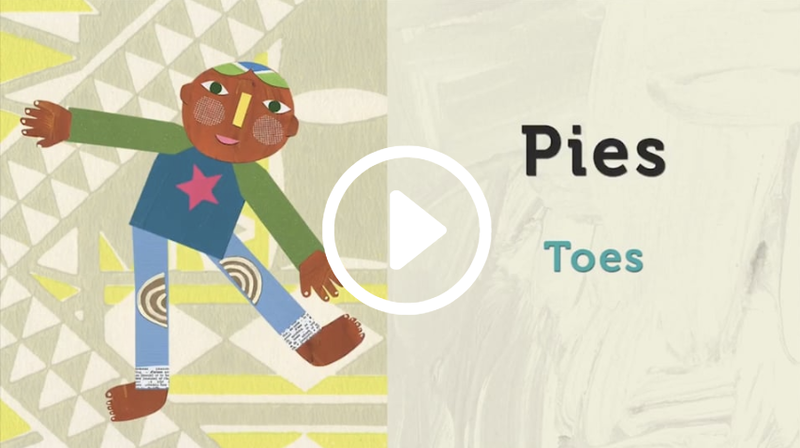 Songs and stories are a great way to share knowledge with parents and grandparents, too. 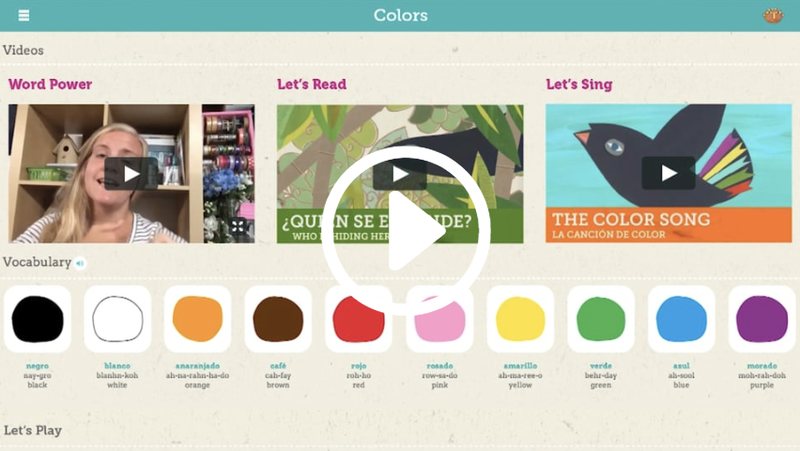 With a focus on songs and stories, we’ve built everything you need to be inspired and ready, in your classroom. Uno, Dos, Tres, Cuatro, Cinco, Seis, Siete, Ocho, Nueve, Diez! Stop and pause along the way. Listen to the new sounds, ask what’s happening, notice details. Have fun, as this is story or singing time. Read on for more activities! Next, time for a supporting activity. What will it be? Movement, art, sound? Here are three examples. What: Through movement and cognitive function, this gets the body and numbers moving. Gather the group together in a circle and get ready for movement. 3. Turn around _x_ times! Change up the movement. Change up the number of those movements they do. What movement patterns can they make? What: This simple activity is perfect to strengthen fine motor capabilities and number recognition. Materials needed: Colorful plastic beads, pipe cleaners. TIP: Make sure to leave “8” slightly open to make it easy to add beads. Sound: Do You Hear What I Say? What: Time to listen, and respond with a sound based activity that supports collaboration abilities. Begin by gathering students together. 4. Example: CINCO … class claps 5 times! Next, here are four ways to weave the learning in, which can be repeated throughout the year. Raise your hand if you heard…? What happened in the story/song? Zid Zid into your classroom. 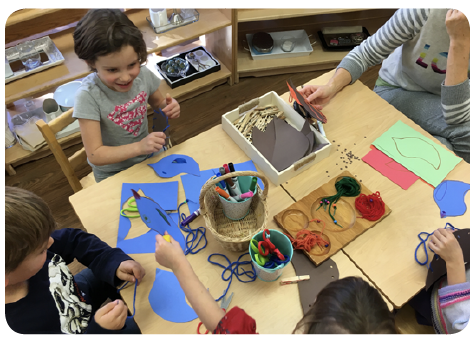 Inspired by the Zid Zid Sewing Nest activity, the children are using paper, yarn, scissors, markers, to create sewn “nests” for their colored birds. 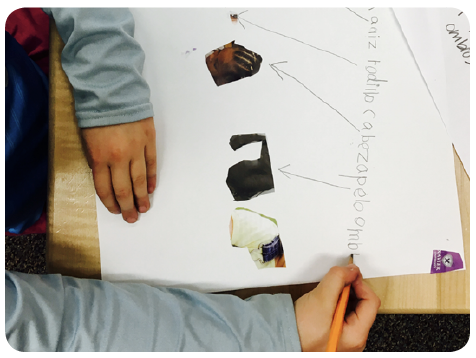 Children are engaged a Zid Zid printable which focuses on the identifying the parts of the body in Spanish. 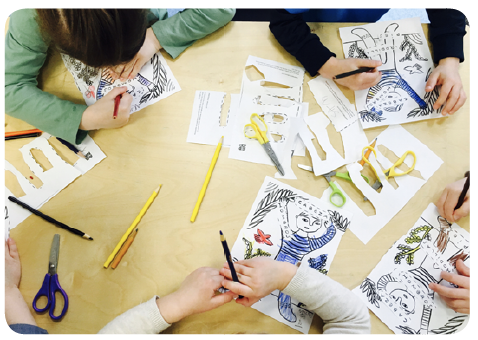 They used scissors, glue, and colorful drawing materials to complete their mission. Here, children are beginning to create self-portraits based on the color blue, and Picasso’s “blue period”. 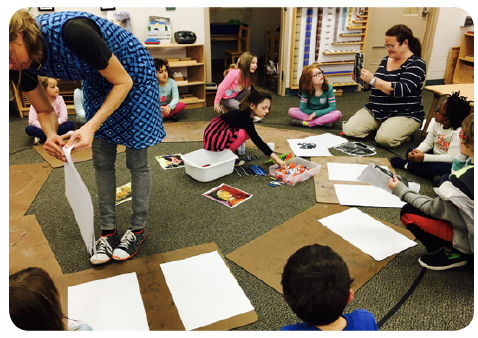 They used photocopied photographs of themselves, scissors, glue, and blue watercolor paint, and blue chalk to create stunning self-portraits. Children headed outside to locate interesting nature items in multiples. 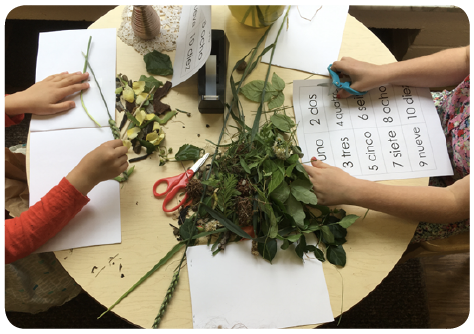 When back in the classroom, they were given blank books, printed numbers, glue, and scissors, and each child worked to assemble a nature count book based on his or her outdoor findings. Children are working off a hand drawn guide by their teacher, to identify the parts of the body. 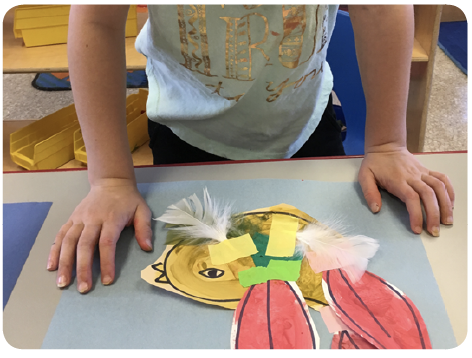 They are doing this by using cut-out magazine pieces they found of the different body party, gluing them into place onto their paper, then working to write the name each part in Spanish. This creative teacher made a large paper game board based on each of the shapes. From there, she created a bag of smaller shapes. She would choose a shape from the bag, have the children look at it, call out its Spanish name, and then they would place it in the appropriate box. She repeated this game until all the shapes were placed properly. Inspired by the Bird Feather Color Mixing activity, this class painted fathers using tempera paints. Each child was given red and yellow to make orange, and yellow and blue to make green. Once all the feathers were dry, they were cut out and placed onto the bird using washi tape, along with decorative feathers for a fun touch. In addition to the power of stories and songs, we believe in achieving goals, and helping your class stay motivated, and on track. There are 120 core vocabulary words, 120 creative activities, plus vocabulary in the stories and songs, and all the creative activities you will invent! That’s an amazing amount of learning. To stay on track and celebrate growth, you have a Zid Zid Growth Chart, Zid Zid Stickers, and a Zid Zid Vocabulary Poster. We believe in learning together. We believe little steps together can lead to big learning. We believe parents benefit from your guidance. We believe in sharing our work. We believe in tolerance of other cultures. We believe in being a part of the global community. Let us understand we are immensely powerful. 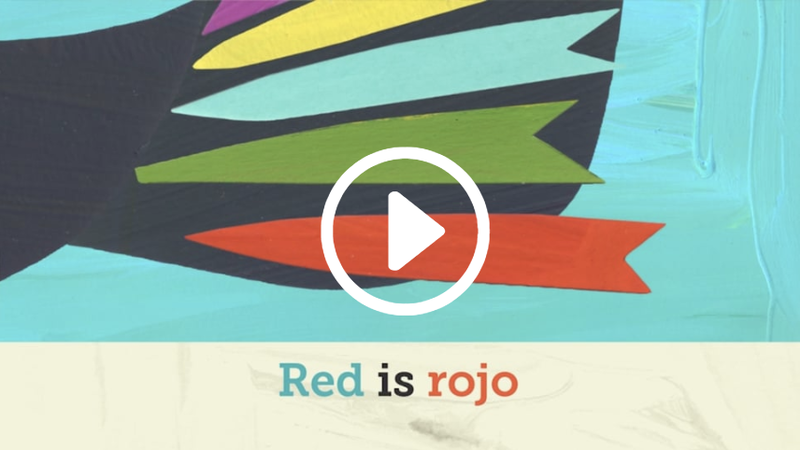 Through our gifts as teachers, we can bring Spanish to life. Let us create a bond with the unknown we are about to enter, even if scary at times. There is no limit to our curiosity and possibilities. Start with stories and songs. Share and connect with your community, online + off! Have fun, this is about play. Who is Behind Zid Zid? 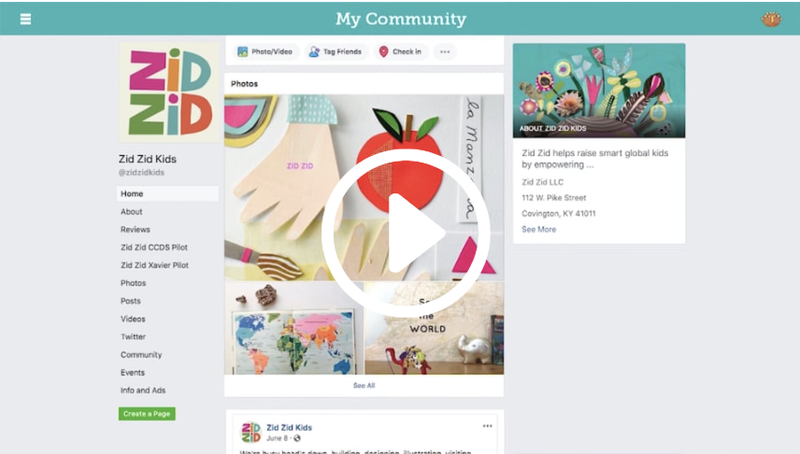 Started by a husband-wife duo who are both trilingual, and have raised two trilingual children, Zid Zid is a team of educators, designers, language experts, and technologists passionate about creating meaningful and impactful learning outcomes for little ones. We merge the best practice in early childhood education with the best in technology to foster a love of learning languages and much more. Will My Class Become Fluent? We aim to eliminate the fear of learning a foreign language during the most critical period of a child’s brain development and set a strong foundation for future learning. Our goal is to inspire you and your class to develop a love for languages. Remember, our focus is on exposure, experiences, and the amazing journey of learning a language. It’s not about outcomes, memorization, or fluency. 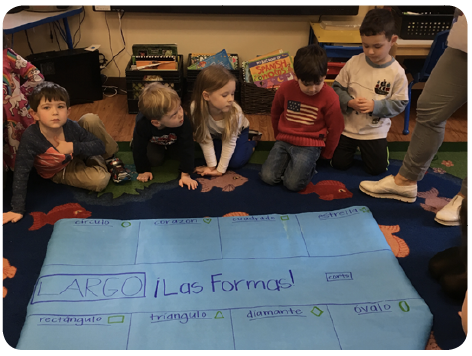 What happens if Spanish learning ends after kindergarten? We now know how critical languages are in the early years, which is no less important that other skills such as academics, play, the arts, and sports. Not only that, but second language learning creates a deeper understanding of and appreciation for humanity and culture, which enriches anyone’s life and personal experiences at any age. As their teacher, you have the unique opportunity to be the very first exposure to another language for a child, and that child will most likely remember this experience for his or her life. What if no one around us is speaking Spanish? This could be said for the importance of play, music, sports, art, cooking, the global community at large, in addition to other extracurriculars. If no one around me is playing baseball, then learning how to throw a ball has no purpose. What Academic Standards and Methods Does Zid Zid Follow? One of the many tools we use to hone and create our lessons are the standards put forth by the American Council for Teaching Foreign Languages. We also incorporate the genius of TPR Storytelling ( Teaching Proficiency through Reading and Storytelling or TPRS ), which is a method of teaching foreign languages developed in the 1990’s. We also adhere to Kindergarten Readiness initiatives put forth by Early Learning and Development Standards established at state and national levels. April 4, 2019: Win Two Books! March 8, 2019: Soy Yo Self Portraits! 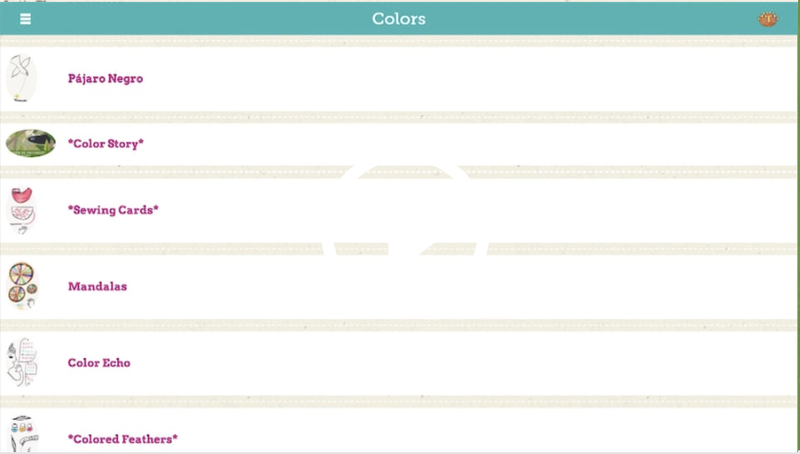 February 8, 2019: Track Growth & Learning!